What is your relationship with time? Good, bad or indifferent? It wouldn’t surprise me at all if the time bandit often has you frustrated at how quickly the hours, days, months and even years seem to disappear, and how difficult it seems to get anything done in the time that you want it done by. Time always seems to be winning; it’s always “flying” by, yet we are consistently surprised at how fast it goes. We feel pressure that we won’t be able to get everything done and help everyone we want to help and that makes us not only less productive, but also less effective and less happy. I have some good news and some bad news for you. Which would you like first? Of course, the bad news…you will never finish everything you have to do, and the only time you will ever be “done” with all the things you have to do, is when you are six feet under. Sorry to have to be the one to tell you that. But… the good news is that we can redefine time and this will allow us to potentially change everything! What do you think about time? Whether you are at association professional, a volunteer or a parent (or quite possibly all three, whether you are trying to get out the door for soccer practice or attempting to squeeze in a work out, whether it’s getting out of the house early in the morning or winding the house down and crawling into bed, each moment holds the capacity to deliver a feeling of either stress or peace. • Consider time your friend, not your nemesis. Shift the way you look at time and it will be much easier to “find” time. • Watch your words. Eliminate – “I’m late”, “I’ll never get finished,” “I’m always rushing”, “I don’t have time” – all of those phrases feed your subconscious mind with the information – “No time”! • Program new thoughts. “There is exactly enough time to do what I have to do.” Believe it and go! • Set a deadline. I will work on this project until 11:30. I will go to bed at 10:30 three nights a week. I will make my calls until 15 minutes past the hour. Remarkably, our work expands to fit the amount of time we give it. Set a limit and stick to it, this will also help the procrastination. • Relax. When it seems time is getting the best of you, take two: 2 minutes to breath consciously, 2 minutes to close your eyes, 2 minutes to stretch or move your body, 2 minutes to re-frame the present situation and change the way you are thinking about time. You will ultimately change the way you feel about time. In the end, we all have the same 1,440 minutes in our day. Those minutes will never be enough time to do everything we think we “should do”, but they are exactly the right number of minutes to do what we choose to do. Those minutes are just enough time to do our most high valued and pressing things on our agenda. We are one person with one minute at a time to “spend”, we won’t get that time back and we can’t negotiate for any more. 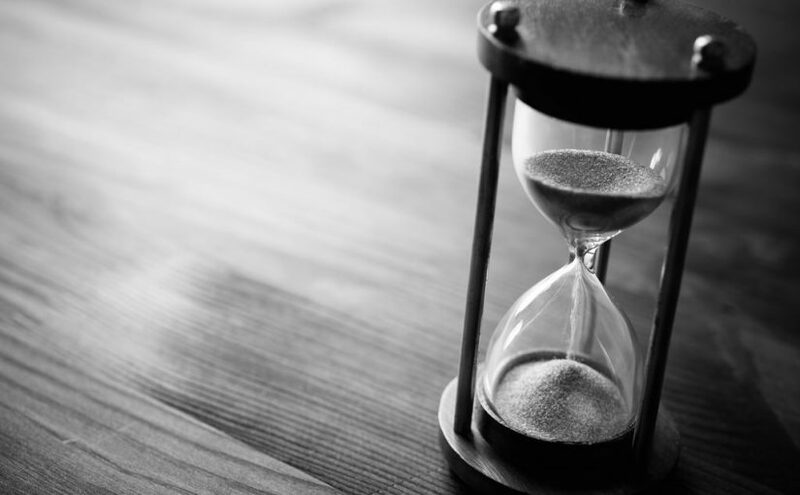 So let’s work on updating our relationship with time, it is on our side, it is our friend, it is a gift, and it is like a grain of sand passing through the hour glass. Do one thing at a time and know that everything else will be there for another day. This entry was posted in Empowerment, Happiness, Newsletters, Personal Growth and tagged e-news, great ideas, happiness, personal growth, Stephanie Staples, Your Life Unlimited. Bookmark the permalink.